Capacity:150-200 m of 3 mm wire.Emergency stop:The winch and the manoeuvre handle has emergency stops. Amir brand floor mounted hand operated crab winch with 2 nos operatiing handle pretested to 50% overload with makers test certificate. 0.5, 1, , 1.5, 2, 3, 5, 7.5, 10 to 20. Light weight winch with electric motor. Comes complete with depth encoder, cable tension gauge, cable, cable head, automatic level-wind, variable speed and direction control, manual brake and emergency hand crank. 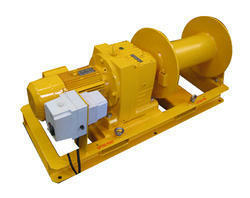 These Electric Winches are designed to pull or lift loads to very high heights. 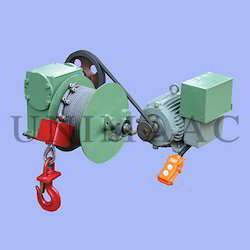 Single layer or multi layer winches can be supplied as per requirement. Band brake can be provided for manual operation. - Wire rope speed - 0.1 Mtr/Min. To 30 M/Min.